Congratulations on your new Whittaker Smart Care® System! With every square foot you clean, you will be extending the life of your carpets and improving their appearance. 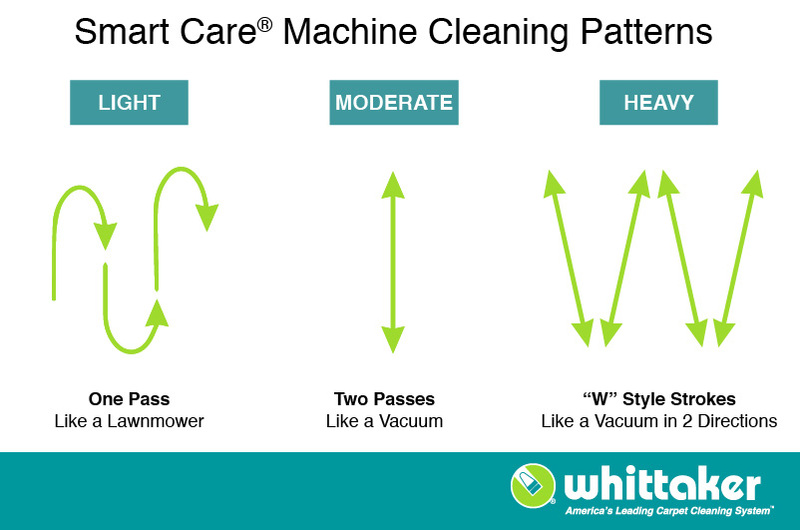 To get started with your new machine, or to learn more about how Smart Care® machines work, keep reading to see our Standard Operating Procedure (SOP) for the TRIO. You can see how simple it is to operate our machines and how little training is required to mix our carpet cleaning chemistry and start cleaning quickly. 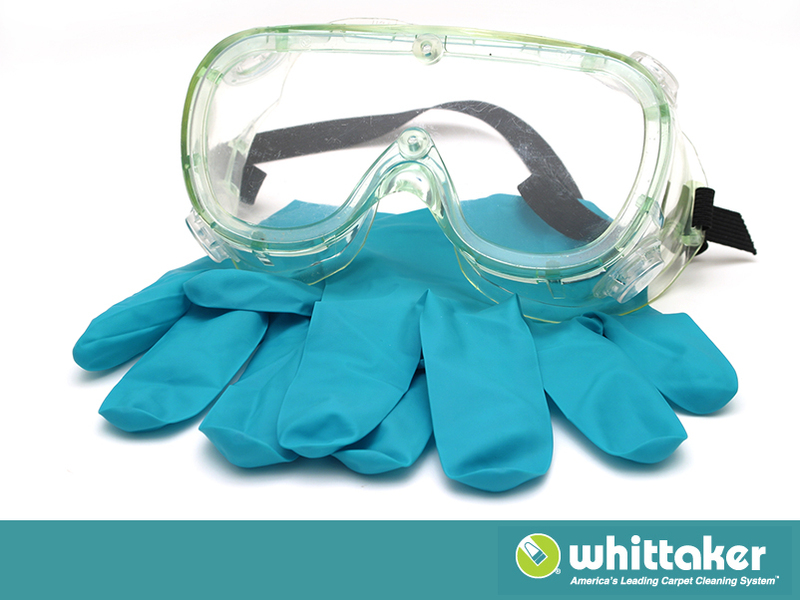 Put on the necessary Personal Protective Equipment, which includes nitrile gloves and safety glasses. You may also want to put up wet floor signs in the area in which you are working, especially if the facility is still occupied while you are cleaning. 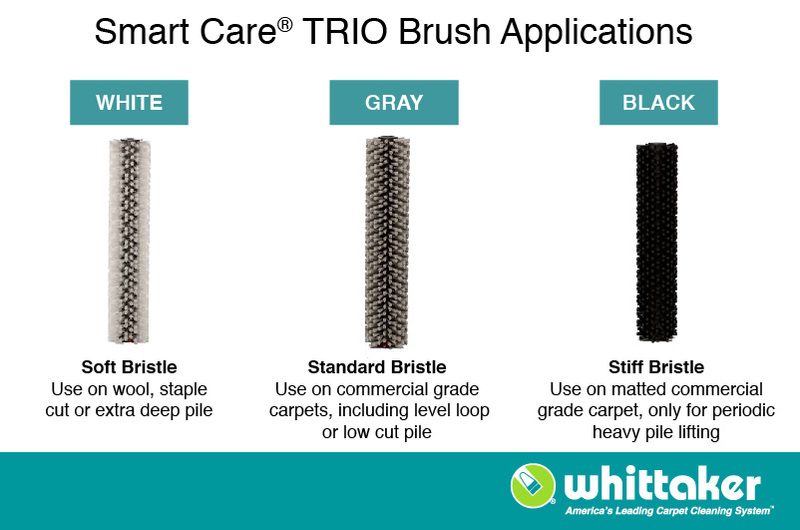 Inspect and install the proper brushes on your TRIO machine. Inspect the power cord for cuts and abrasions to the cord. Be sure the three-prong grounded plug end is not broken or removed. Add two gallons of clean water to the TRIO solution tank. a. 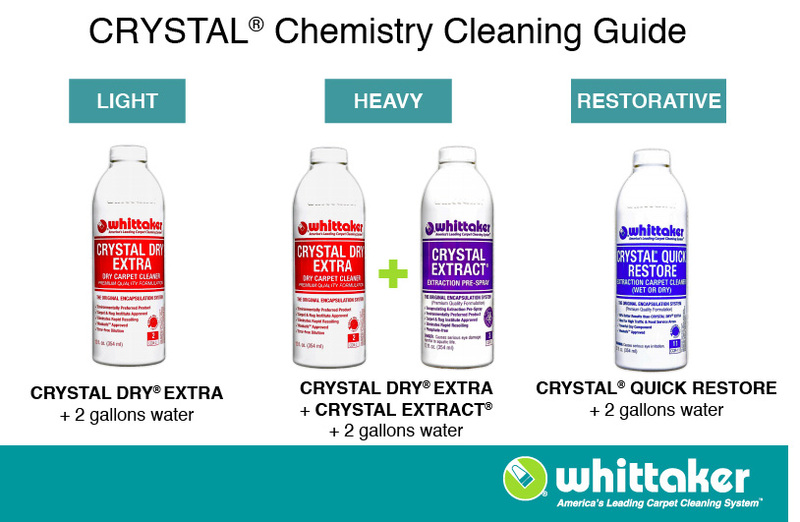 For regular soils during interim cleaning, add one bottle of CRYSTAL DRY® EXTRA encapsulating chemistry. You will need a minimum of one 12-oz. bottle for every 2,000 sq. ft. to be cleaned. b. For heavily soiled carpet, add one bottle of CRYSTAL EXTRACT® plus one bottle of CRYSTAL DRY® EXTRA to two gallons of clean water. c. For heavily soiled restorative carpet cleaning, add one bottle of CRYSTAL® QUICK RESTORE™ to two gallons of clean water. Plug the power cord into a grounded receptacle outlet. Turn the machine on by stepping on the foot pedal and slowly lowering the handle. Operate the TRIO by pulling the solution control handle to apply chemical solution in front of machine as you move forward. Work away from power outlet. - Make long, straight passes while applying chemical solution similar to the motion of a lawnmower. - Release the handle at the end of the pass as you turn the machine back in the opposite direction. - Overlap your passes by a minimum of 1-2 inches to avoid streaking. - Operate the TRIO by pulling the solution control handle on forward “wet” passes, and releasing the solution handle on backward “dry” passes. - Use 3 ft. long strokes in a “W” style, similar to the pattern used with an upright vacuum cleaner. Overlap each forward pass by 1-2 inches or more. Apply chemical solution on forward passes. When you are finished cleaning, or you need to refill the solution tank, turn off the machine by raising the handle to the upright and locked position. Unplug the power cord before refilling the solution tank. Repeat steps 4-6. When you are finished using your TRIO, remove the solution tank, empty it, and rinse it with clean water. Leave a small amount of clean water in the tank, Replace the solution tank. Operate sprayer for a few seconds to flush chemical solution from pump and spray nozzle. Unplug the power cord and wrap the cord from the handle of the machine to the plug end. Tip: Use an absorbent cloth to wipe the power cord while winding it. This will keep the power cord clean and dry. It will also help you feel cuts in power cord that will need repaired. Tip the machine backwards onto its handle. Remove brushes by pushing on the axles from the side of the machine. Wipe the underside of the machine and brush axles. Rotate brushes end to end and replace them on the TRIO. See how to rotate brushes in our TRIO machine training video. Stand the machine upright. Empty the collection hopper. Lift up and pull out. Replace the collection hopper. Slide in and press it down to lock the hopper into place. Return the TRIO and other materials to your storage area. Carpets may be vacuumed after they are dry, usually in about 30 minutes, or at the next regularly scheduled vacuum cycle. Carpets will look cleaner immediately after they have been treated with Smart Care® Chemistry. You can view all of these steps in video format in our Training Videos. To read the SOP for TWIN machines, click here.